From the streets of Madison’s farmer’s markets to the shores of Lake Superior, Yahara Bay Distillers search the Wisconsin and midwest to find grains cultivated by local growers to make Rökker Vodka. Hand-crafted in small batches creates a world-class taste with local roots. 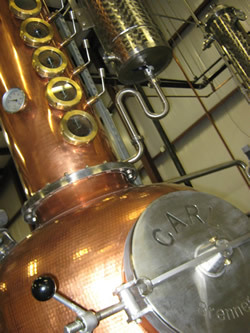 Center stage in the distilling process is “CARL”, the 90-gallon, 15 foot copper pot still. From each batch created, the “heads” and the “tails” are removed, leaving the “heart” which contains the highest levels of purity, which not only taste better, but helps you avoid impurity induced headaches. After refining and filtering, each batch creates enough liquor for approximately 450, 1 liter bottles which are bottled by hand in the warehouse. Proprietor and Chief Distiller, Nick Quint is a man dedicated to his passion — that of crafting fine spirits from the best products Wisconsin has to offer. Coming out of retirement at the age of 61 to pursue this vision in 2007, Nick studied at Michigan State to learn the art of the still. 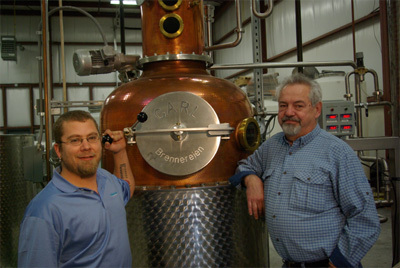 Nick and his stepson, Lars have steered Yahara Bay from that day forward, experimenting and then crafting award winning spirits. Part scientists, part artists, and whole hearted aficionados, Nick and Lars are having a blast distilling in Madison! Yahara Bay Distillery is open every Thursday evening from 5-10pm to the public. The art gallery in front features local Wisconsin artists and Yahara Bay Products are served. Tours happen daily, just call ahead and if Nick or Lars are at the distillery, they'll give ya a tour and tasting!